The San Antonio Breast Cancer Symposium (SABCS) is the premier conference in the U.S and the world designed to provide the latest on the experimental biology, etiology, prevention, diagnosis, and therapy of breast cancer and premalignant breast disease to health professionals, physicians and researchers. The SABCS is celebrating its 41st anniversary in 2018. 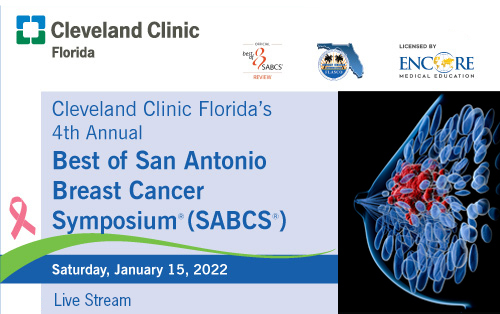 This SABCS Official Review sponsored by the Cleveland Clinic Florida and endorsed by FLASCO allows professionals the opportunity to witness the highlights as originally presented at SABCS 2018 in a one-day program. You will learn the current advances in research and state –of-the –art information on breast cancer that are changing clinical practice for the benefit of patients. This program is the official SABCS Review in South Florida and will provide the latest update on imaging, surgery, local and systemic therapies surrounding HER2+, triple negative and BRCA-related breast cancer, and hormonal therapy, in addition to advances in molecular prediction models and survivorship. This important educational activity also provides a forum for interaction between individuals involved with all aspects of breast cancer care and the opportunity to discuss research advances presented at SABCS with colleagues and key opinion leaders. This review course is directed primarily towards academic, physicians and researchers involved in breast cancer in medical, surgical, gynecologic, and radiation oncology, as well as other appropriate health care professionals.